Over the years I’ve walked this walk in the sunshine and the rain, in hailstones and wind, with ice underfoot and snow on the fields, sinking in mud or in sandals and shorts. I’ve been this way with Mr RR countless times; we’ve walked it with others, with children and friends ….. and once I remember with Alfie the dog. I’ve seen sea birds and song birds and kestrels and buzzards, horses and donkeys and rabbits and deer. I’ve even seen a hare! Seals and ostrich (!) 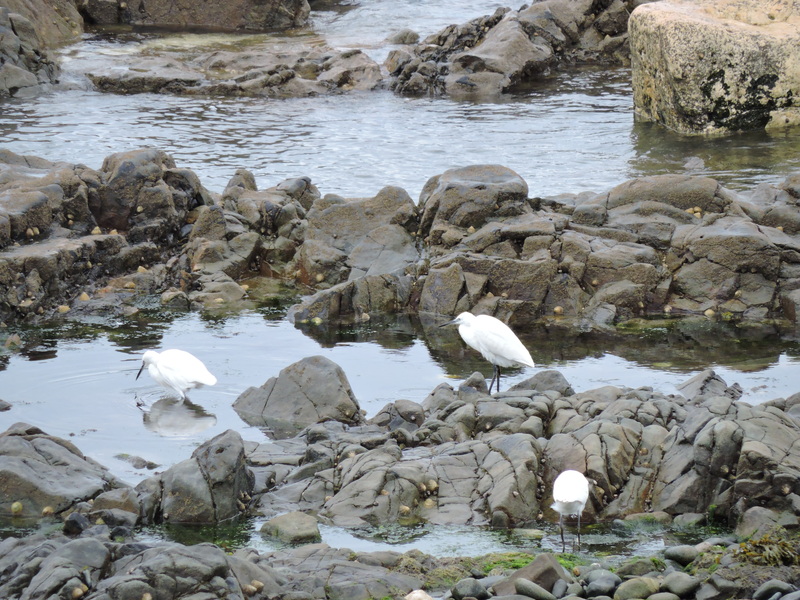 and egrets and geese, hikers and bikers and ramblers and climbers. You name it, we’ve seen it here! I’ve been here in winter and summer, autumn and spring, seen daffodils and bluebells and tamarisk and orchids. We’ve picked blackberries and sloe berries, and watched cabbage, cauli and potatoes crops grow. We’ve seen rough seas and calm seas and surfers and kayaks. We’ve seen the fields under water and the beaches change shape, as the cliff face erodes and the paths are diverted. There have been days when it’s clear across to The Mount and days when The Mount disappears in the mist. 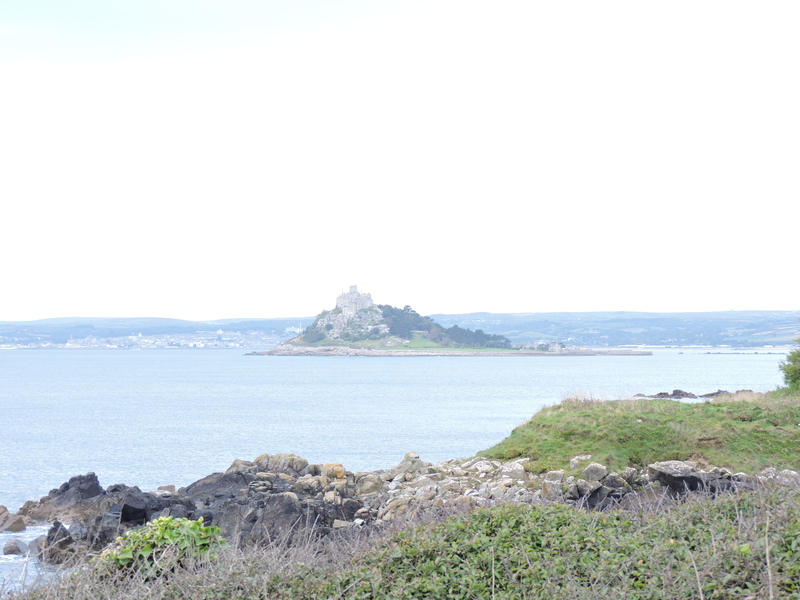 There are times when it’s clear right across to Penzance and times when you can’t see the sea for the fog. I’ve seen it all on this walk. I think I might miss this one. Today we went the ‘right’ way round. 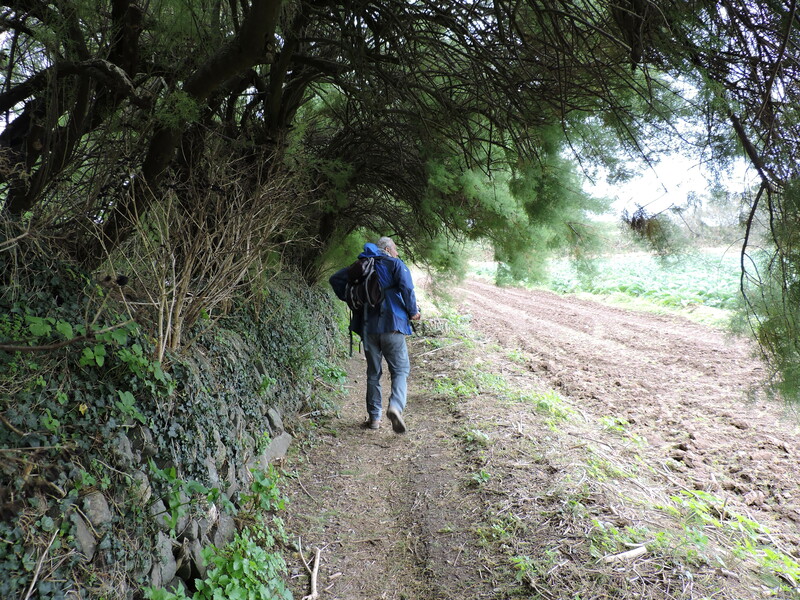 Starting down by The Cabin and heading west (maybe…we turned right anyway) along the coast path. It’s dull and cloudy, but it’s dry for the moment. As we pass through what was the potato field, now lying empty but for weeds, a flock of small birds rises up and scatters nervously away – a parcel of linnet probably I think. And then I wonder at myself …….a year ago I would barely have given them a glance – now I know what they’re likely to be from their flight pattern! Astonishing! We turn briefly inland heading up to the lane which will take us to Boat Cove. 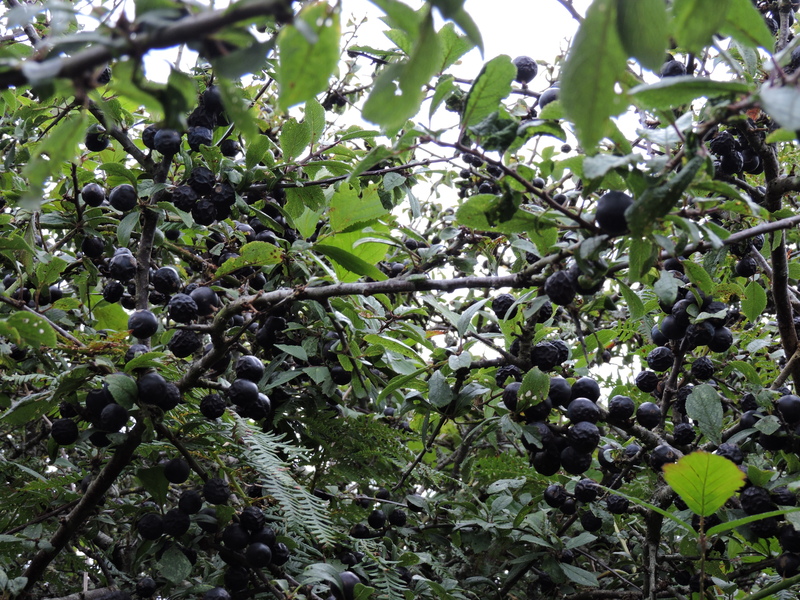 There are plenty of blackberries ripe for picking – and the sloe berries are ready too. 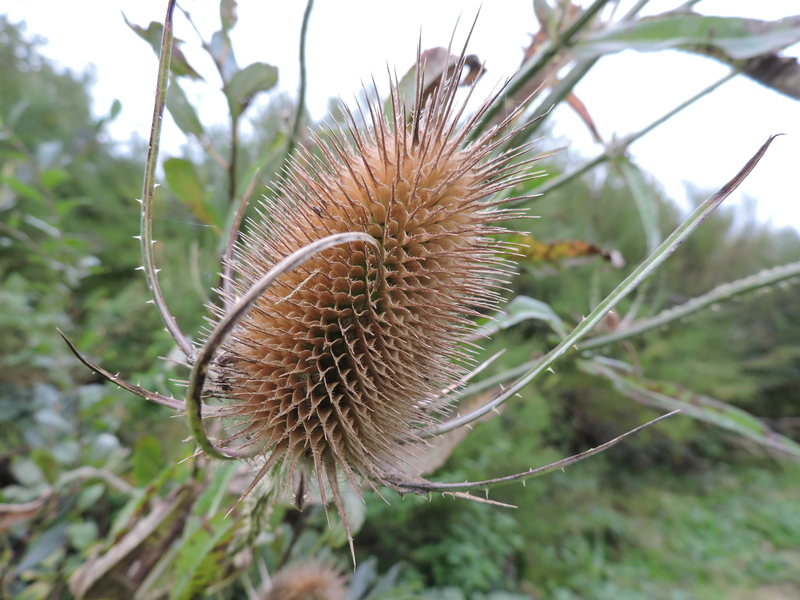 With spiny prickles all over the stems and it’s dense, prickly flower head surrounded by spiny bracts it’s an unusual but beautiful plant – even though the pink flowers have long gone. 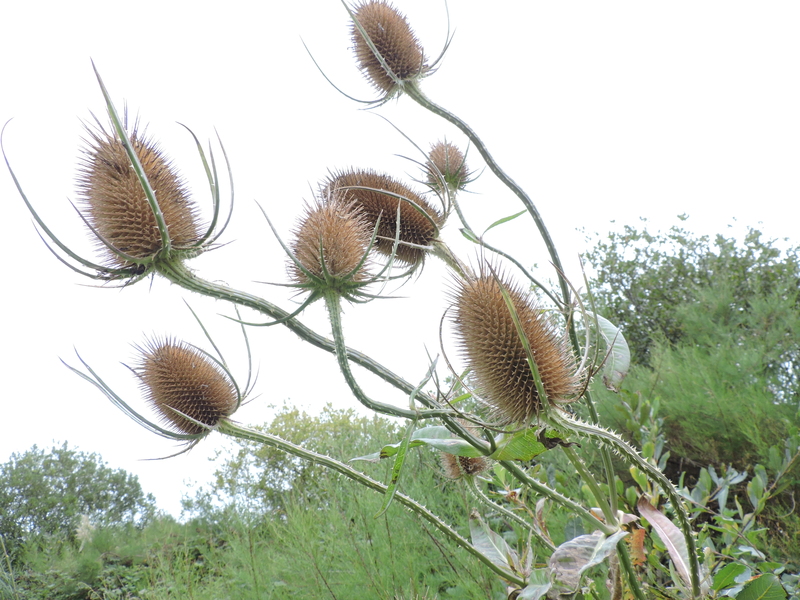 The cultivated variety of this plant – known as Fuller’s teasel – is used in the textile industry where, apparently, the curved bracts are used to raise the nap of woollen cloth for the manufacture of velour or cashmere. Did you know this? I didn’t……but Mr RR did! How did he know that? Rain water collects in the cup-like structure around its leaves, which accounts for the botanical name Dipsacus which means ‘to thirst’. Insects sometimes get stuck in here and drown and it’s thought that bacteria then break down the bodies and provide the plant with some of its nutrition. Herbalists used to think this water was beneficial, but didn’t seem to find much use for the rest of the plant, although an ointment made from the roots was used as a cure for warts. 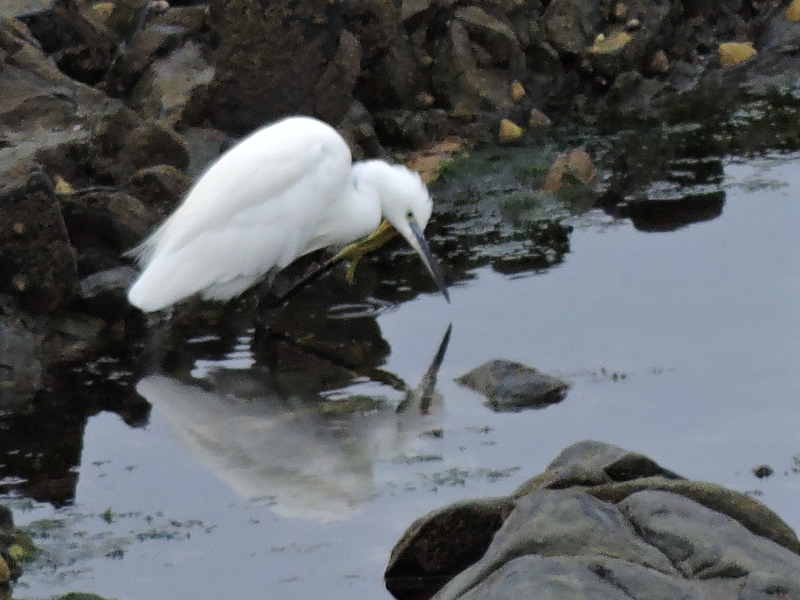 Mirror, mirror, in the pool Who is the fairest of us all? 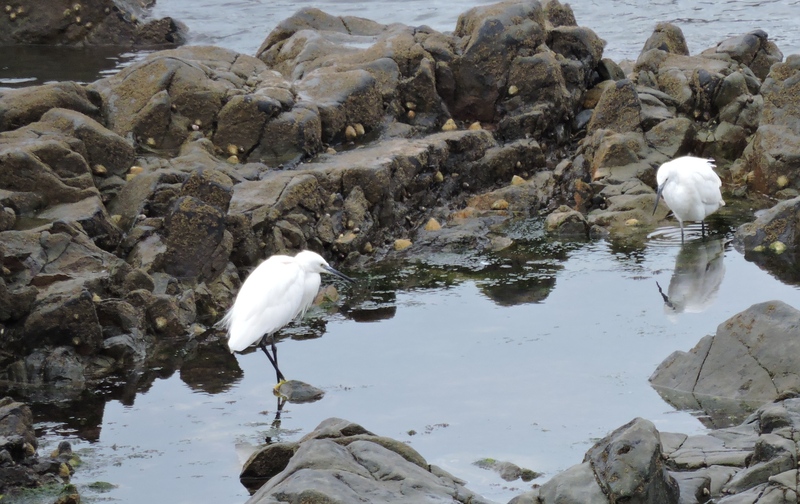 There are about a dozen scattered along the rocky coast here feeding from the rock pools. 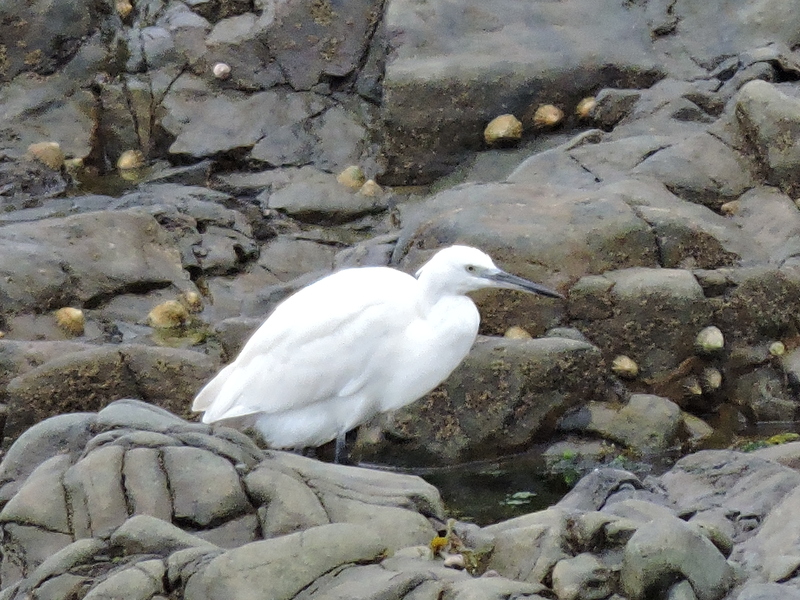 Little Egrets are actually white herons, though much smaller than the Grey Heron, they have a fine black bill and black legs. They breed in colonies but usually feed singly. They often swish about in the water to stir up the mud disturbing small fish. They especially like sticklebacks, loaches and small carp. 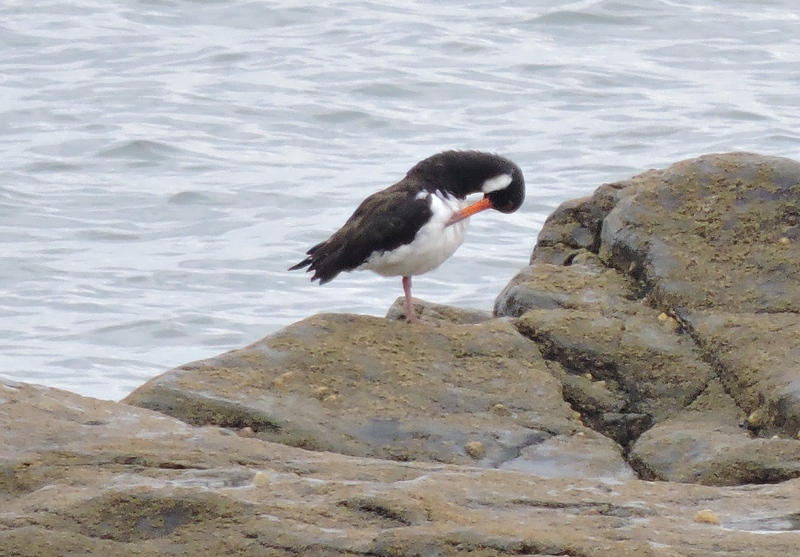 These on the coast also eat crustaceans including shrimp. 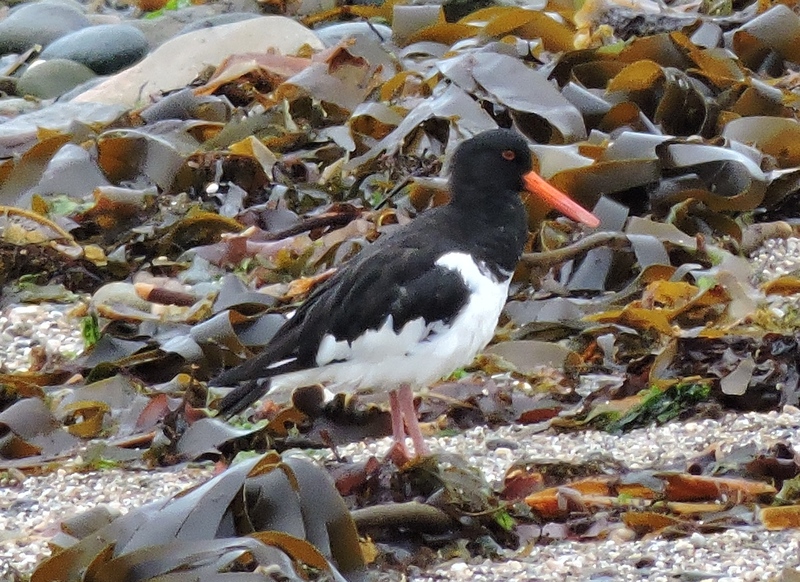 These are waders with that long, long, orangey-red bill which they use to pick up shellfish, crabs and lugworms. 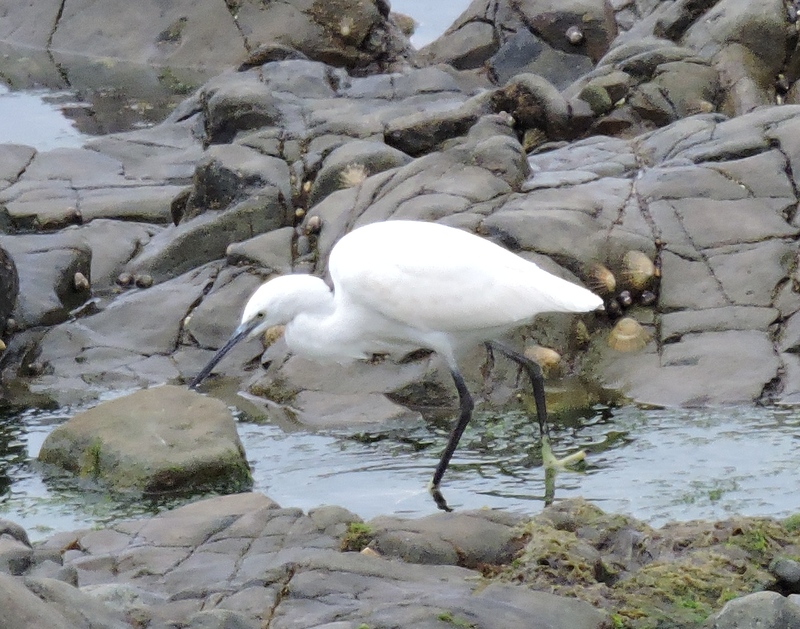 If you see them further inland they are usually searching for worms on grassy banks. They’re sociable birds and can be noisy and excitable, even holding ‘piping parties’ where they run along side by side calling loudly – part of their display to establish territory. 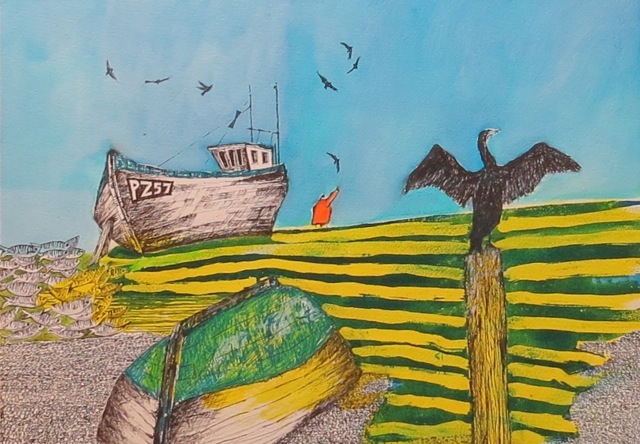 There’s curlew on the far side of the beach and as we watch another swoops past calling its distinctive ‘cour-eeeee’ call, and out on a rock a cormorant spreads his wings to dry. At the road we turn downhill and walk into Marazion debating whether to stop for a cup of tea here or to wait until we get back to Perranuthnoe. In the end, there’s rain in the air – also it’s difficult to beat The Cabin in Perranuthnoe for a cup of tea after a walk – so we don’t stop long but head back up the road and down the lane which takes us on the high inland path back to the village, below us a pair of buzzards circling the fields ….. These are ‘Whitebred Shorthorns’ and are owned by Karen Wall of the Trenow Cove Dairy, one of the smallest commercial dairy in the UK! 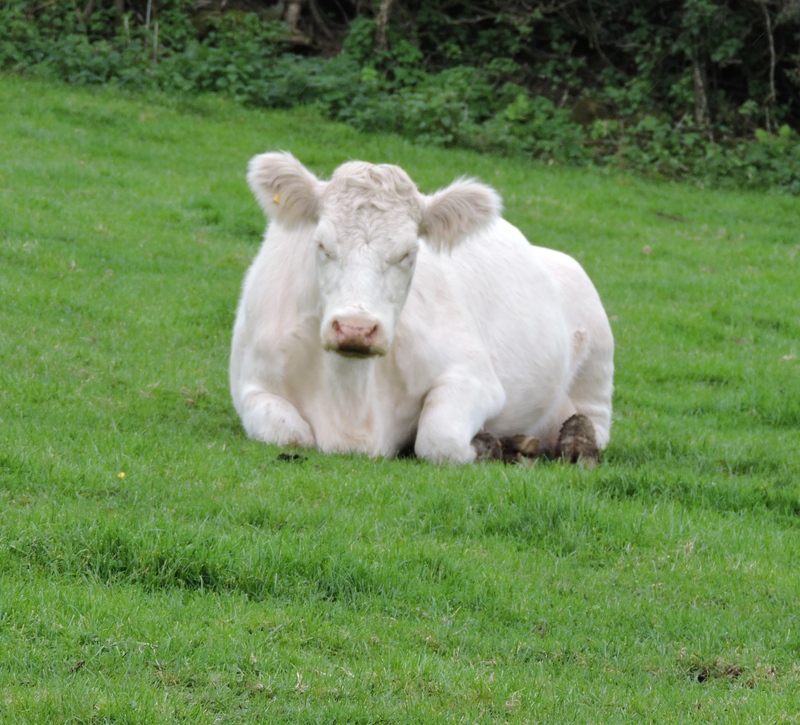 Daisy, Buttercup, Primrose, Lily, Snowflake and Gwinny graze the fields overlooking St Micheal’s Mount – when they aren’t up on Penrith Moor conservation grazing. 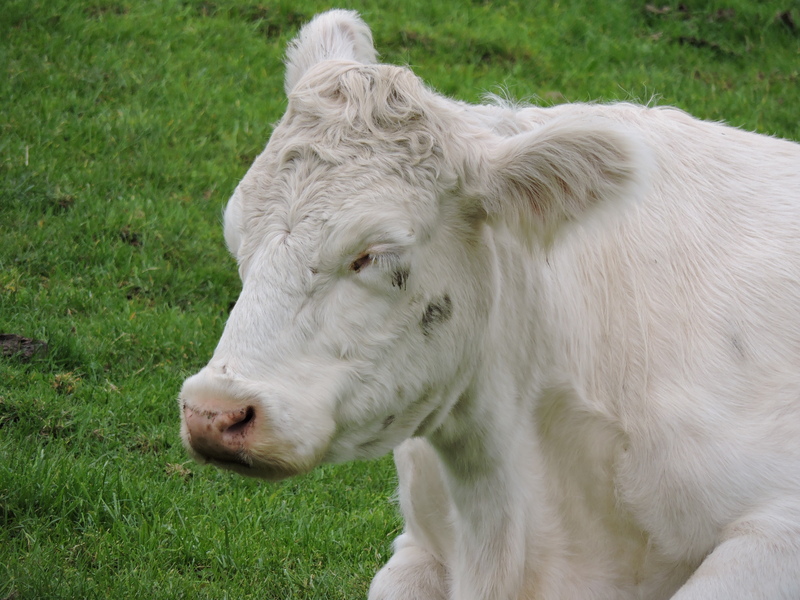 These lovely (yes, I know…..I’m not keen on cows, but these might be the exception) creatures have the most ginormous fluffy ears…I mean, just look at those ears! The other name for this breed is the Cumberland White and they are a critically endangered, indigenous species of which there are fewer breeding females than there are giant pandas in the world! They originate in The Scottish Borders (!it just keeps happening) but were almost entirely wiped out in the foot and mouth outbreak in 1968. Having admired the ears, we move on uphill and along the lane, down past the church and through the village to a crowded Cabin, where we squeeze into a corner with a hot cup of tea and a large slice of Victoria sandwich! It had to be done one last time!